Sorry guys, when you’re wading chest deep through spring runoff, launching laser beam casts to 20-pound steelhead—size matters. Meaning the size that fits. 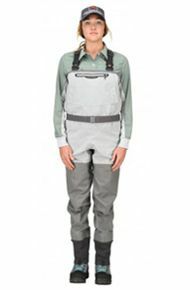 Simms’ Women’s G3 Guide™ Waders are sized right from a slim boot to accommodating upper, with microfleece-lined hand warmer and zippered chest pockets where you need them. The women’s specific cut features patented front/back leg seam construction to minimize wear and delivers enhanced mobility befitting of extra-big pursuits.